From left are city volunteer Brittney Jerred, Parks and Recreation Superintendent Barry Ostrander, Mayor Ron Woodward, Director of Community Development Joe Fiumara, city volunteer Marie Mankiewicz, Rural Health Network Coordinator for OCO Leanna Cleveland, City of Fulton Department of Public Works employees Noah Hausele, Thomas Schimpff, and Zachary Janes, and Department of Public Works Commissioner C.J. Smith. FULTON – The city of Fulton was recently able to complete sidewalk repairs along the Canalview Bridge Walk thanks in large part to a $5,000 donation provided by Oswego County Opportunities. Mayor Ron Woodward, city employees, and city volunteers recently met to thank OCO for its donation. C.J. Smith, Public Works Commissioner for the city, said his staff was able to fix 43 areas of sidewalk around the bridges that will help improve safety and accessibility along the bridge walk. 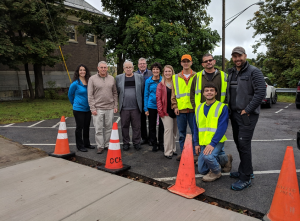 “I was happy to be a part of this project and am pleased that with OCO’s help and the great work of our crew the city could help make these sidewalks safer for people,” said Smith. Leanna Cleveland said OCO was happy to assist the city of Fulton with this project. Brittney Jerred and Marie Mankiewicz – two volunteers and co-founders of Fulton Foothpaths who have been working with city officials to improve sidewalks and trails throughout the city and other efforts – were thrilled to see the sidewalk repairs complete. Both noted that the repairs complement other planned improvements set forth in a multi-use trail study recently adopted by the city. Making this bridge walk more functional and user-friendly invites more people to walk and enjoy the Oswego River and the canal. We look forward to seeing more improvements like this for more people to appreciate our city’s rich history and scenic waterways, said Jerred and Mankiewicz, adding, A big thank you to OCO for assisting and thank you to the mayor and everyone who helped make these repairs a priority. Smith, along with Joe Fiumara, executive director of the city of Fulton’s Community Development Agency, and Barry Ostrander, city of Fulton Parks director, have also been integral to recent planning efforts and the trail study. Fiumara said this repair project fits in perfectly with the city’s planned trails. In 2016, the city of Fulton was awarded a $61,500 grant from the New York State Department of State to complete the study. Last year, the city contracted with Environmental Design & Research, the firm that is providing architectural and engineering services for the study. As part of the grant, the city is also updating its draft Local Waterfront Revitalization Plan which will help the city plan for the future of its waterways and help the city qualify for additional grant dollars. The city recently applied for a state grant to help construct the multi-use trails. Awesome news for Fulton. A lot of people’s hard work paying off! Thank you to Britney Jerred and Marie Mankiewicz col founders of Fulton FOOT PATHS for all their hard work.Thank you to OCO for their commitment to their community.Thank you to the CITY for making things happen.